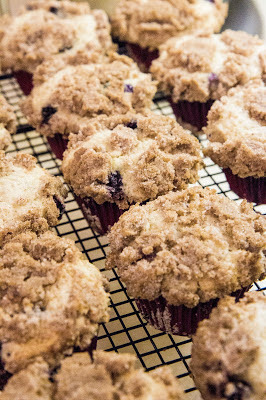 These Blueberry Muffins are delicious! I adapted a couple of different recipes to be allergy friendly for my 8 year old. This was a WIN! The allergy friendly Brownie attempt I made this past weekend, on the other hand.... lets not even talk about the fail that those were. Here you have, another one of my NOT healthy, but yummy, treats! The things commonly found in baked goods that we have to avoid are dairy, barley (in most all purpose flour), soy (vegetable oil is soy), rice and nuts. So, this is why my recipes are the way they are. 2 tablespoons of ground flaxseed meal mixed with 6 tablespoons of warm water in a separate bowl (allow to sit a few minutes before mixing everything together.) This replaces 2 eggs. 1/2 cup Earth Balance Soy Free Buttery Spread cut/broken up into small chunks. 1.Preheat oven to 400 degrees. Grease or line standard size muffin cups. 2. Combine 3 cups flour, 1-1/2 cups sugar, salt and baking powder, then add flaxseed meal mixture, canola oil and almond milk. Mix together. Fold in blueberries. This batter is very thick, but bakes up excellent. Fill muffin cups to top and sprinkle with crumb topping. 3. Crumb Topping: Mix together 1 cup white sugar, 2/3 cup flour, 1 tablespoon cinnamon and combine that with the crumbled buttery spread. I use my hands to smash/crumble it all together. This makes a very generous amount of topping. This recipe should be just as good with eggs, regular milk and butter for those who aren't concerned about allergies. Impromptu photos are always the best!